Have Your Say On Toronto's New "Street Furniture"
Yesterday the City of Toronto unveiled the designs submitted for the “Coordinated Street Furniture Program,” its plan to grant a billboard company a twenty-year monopoly on providing and maintaining bus shelters, garbage bins, benches, and other items for Toronto’s sidewalks. The “renderings” have been posted on the City website as epic PDFs, but our friend Joe Clark has also extracted the images from the PDFs and posted them to his Flickr account for convenient browsing. Go ahead. Take a look. 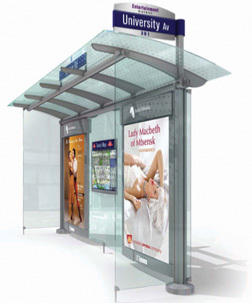 Form opinions about items such as Clear Channel Outdoor’s Megabin-redux of an “Information Kiosk,” shown above, and Astral Media Outdoor’s double-the-ads-double-the-fun “Canopy Transit Shelter No. 101.3,” shown below. Comment on this post, join the lively discussion at the Spacing Wire, or vote in the Toronto Star’s poll. It doesn’t matter, because the City doesn’t care and doesn’t want to know what you think. Unlike with recent competitions to redesign the central waterfront and Nathan Phillips Square, public input is not welcome. This is to be as cloistered a process as possible. Public feedback to renderings will not be used in the evaluation of proposals. The sole intent is to provide the public with the opportunity to view street furniture elements that the City is considering so as to provide context for the eventual recommendations of the Selection Committee. The City and the billboard companies are frightened that the public will again react as negatively to the ad-driven privatization scheme as they previously did in the public consultations and official surveys the City conducted last year. The TPSC (and Torontoist) encourages the public to politely provide comments to, and ask questions of, the jurors regarding the designs. Tomorrow Monday, we’ll have more coverage of the “Coordinated Street Furniture Program,” including why it’s bound to fail this City and its residents. Image of Clear Channel’s “Information Kiosk” from their brochure. 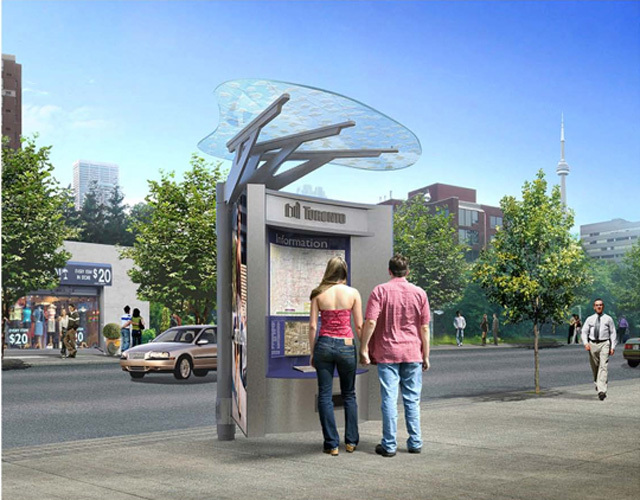 Image of Astral Media’s “Canopy Transit Shelter No. 101.3” from their brochure.